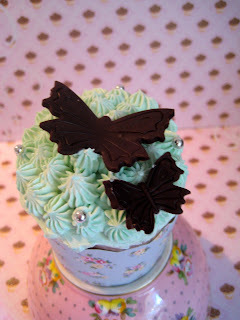 I thought I would show you one of my favourite decorating mediums Chocolate modeling paste. It tastes just like chocolate but is pliable and easily molded into shapes, in fact sometimes it is called chocolate plastic, (but that just doesn't sound very enticing does it). It's great, you can make ribbons, roses and like above cute little butterflies. It can be used to cover whole cakes. It's delicious and best of all it's easy to make. 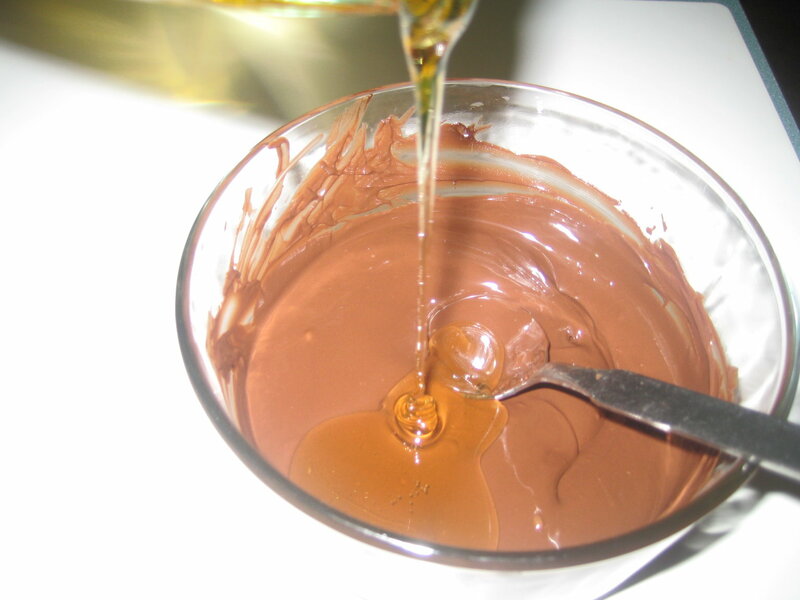 Take 454 g (1 pound) of dark chocolate and 1 cup (240ml) of glucose or corn syrup. Melt the chocolate gently in short bursts in the microwave, warm up the syrup and mix together, not too much or it will start to separate and get oily. Yup - that's it, too easy. I halved the recipe and it worked out fine, you can also use milk or white chocolate (just use 680g or 1.5 pounds to 240ml/1 cup syrup ratio for white choc). Leave it to set and it should look like this and be very pliable. Here are some pics of how I made the butterflies. I feel a bit embarrassed showing you, because it's soo easy. 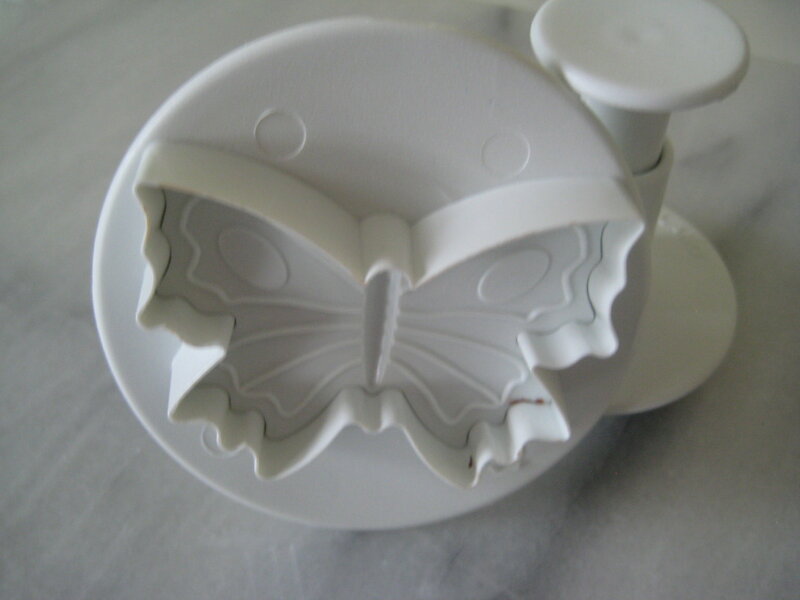 The butterfly cutters I used are PME butterfly plunger cutters (you can easily find them via google or ebay). If you have trouble finding them email me I'll send you where I got mine from. See how they plunge in and out. So roll out the chocolate modeling paste to the thickness you require. Only use small batches as it dries out quickly. One press down will cut out the shape, then without lifting the cutter up plunge down the middle to indent the pattern on the cut shape. See embarrassingly easy. If you want butterflies with flat wings just leave them to set on parchment paper. If you want folded wings, once they are cut out pop them onto some parchment paper folded into a V and then onto cardboard also folded to a V.
Mmmmm - fly into my mouth little butterflies. This gorgeous dress and hair clip are from Tea Princess, available from LaToriana. If you have little girls you have to check out the latest winter range. This is so cool! And useful! and pretty! I've heard about chocolate molding paste before but never thought about trying it...your post has inspired me! 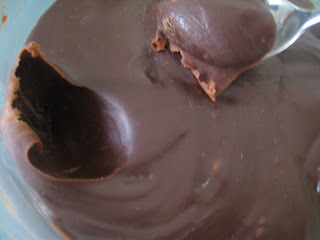 Wonderful I have never heard of chocolate modeling paste and the recipe is so simple and gives you such good results. 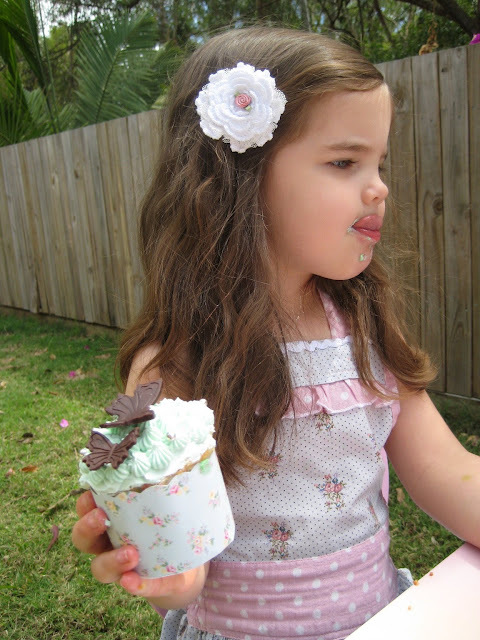 Thank you for the information great work and love the children she looks so cute modeling the clips and butterflies. Cheers from Audax in Sydney Australia. wow... I am going to try these out for Tiana's party!! off to find the moulds! Honestly Linda... you are an inspiration! Linda, I love your "sooo easy...but I had noooo idea...." chocolate modeling paste! Have to try it out! Thanks for sharing! Thanks for all your lovely comments, I hope you have fun working with this modeling paste. 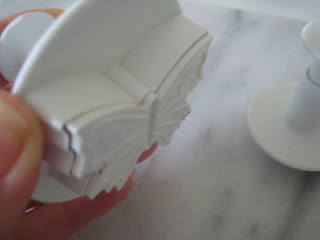 I love that, I will have to think of a use for the technique on one of my tarts, because I want to try it out. 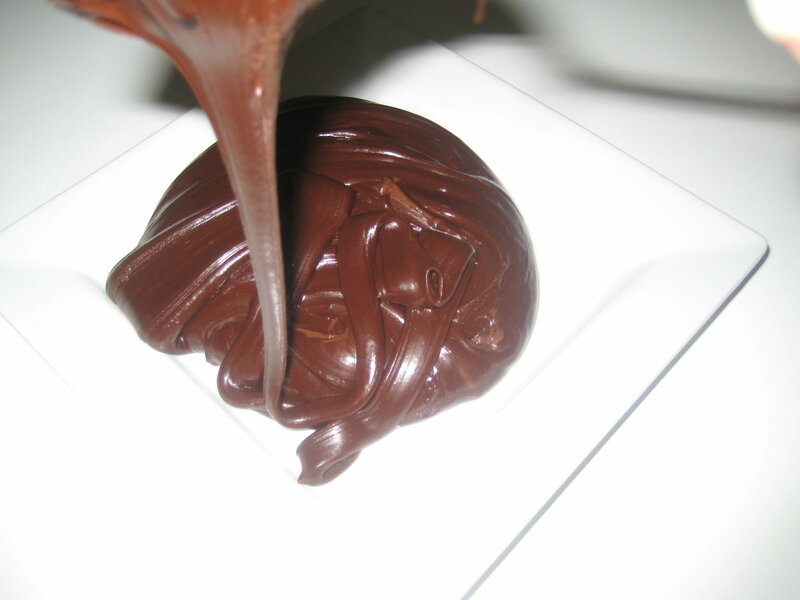 I've tried making chocolate modeling paste a couple of times now and each time it has split and been unworkable. I'm guessing its the ultra expensive chocolate that's needed to make this recipe work? Alice your tarts are lovely I am sure you could do something amazing with this that would look great. Chele - actually I made the stuff in the pics using Old Gold regular eating chocolate (that's just an Australian brand supermarket brand). I think that the trick is to not overmix it or the fats get separated. Great post Linda, how does chocolate modeling paste hold up in the heat? I have to say you are one very talented lady and I feel so lucky to have found your blog. Thankyou for sharing all you beautiful creations and wonderful talent. I am currently planning my daughters 5th Vintage Tea Party and you have given me somany ideas. So Thank you again. Have a lovely day. Danielle. love it !!! I saw another cupcake with rose one. 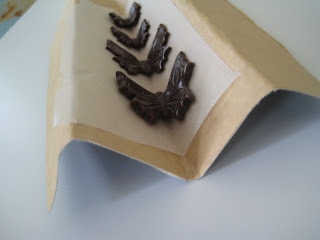 Hi, I tried this but I'm having difficulty getting the chocolate out of the cutters! Any tips on how to get it out? hi, i am just wondering if you use karo brand light corn syrup or our aussie queen brand glucose syurp? i know glucose is thicker, does it work the same? thanks so much if you take the time to reply. loving your site by the way! does chocolate modelling paste still taste like chocolate with glucose added into it.